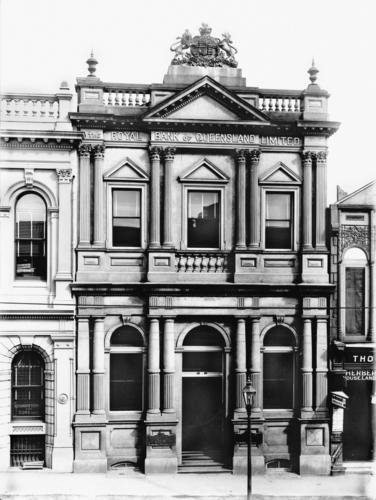 Here is a photograph of the Royal Bank of Queensland in Queen St Brisbane, taken around the year 1900. The building was erected in 1891. Some rationlisation of the banking scene in Australia took place in the years following WWI, and the Royal Bank of Queensland became the Bank of Queensland after a merger, and then was taken over by the National Bank in 1922. 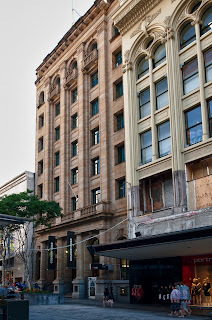 It was decided to build a new office in place of the original building, and Melbourne architects A & K Henderson designed the seven-storey brick and sandstone building that was erected in 1929/30 and was where I opened my first cheque account in 1968. It was known then as National Bank Central Branch, and here is a photograph of it in that guise. 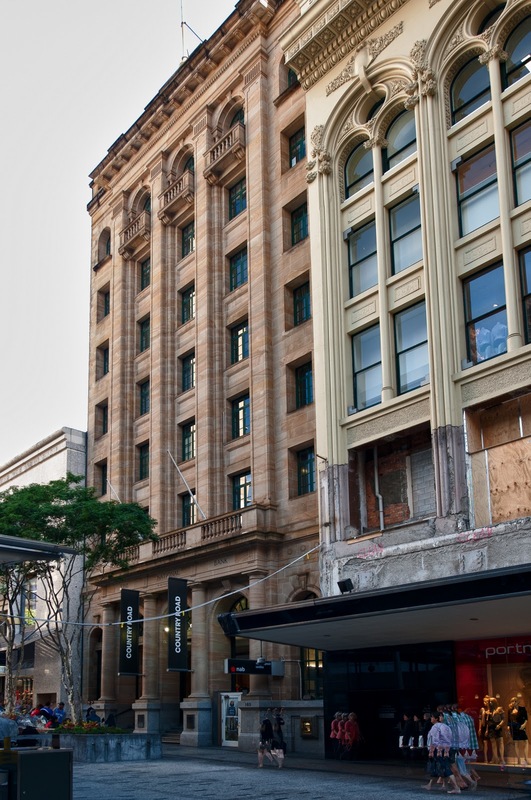 The building, situated in the Queen St Mall, no longer operates as a bank. It is now the CBD home of Country Road clothing - here is a recent picture. I think the first photograph of the Royal Bank of Queensland in Queen St shows an institution that is very solid, reliable, not flashy and not risky. Just as a late Victorian financial organisation should have been! The construction date of 1891 was unfortunate, assuming Brisbane had the same appalling financial crash in 1893-4 that Melbourne had. Banks may have done rather well. There were a lot of mortgage defaults, so assuming a bank could weather the storm it probably could resell the properties profitably.